There is quite a bit ( 1/2" ) of free play in my gear shift lever. Is that every one else experience? I would start by having a look at the external shift mechanism and seeing if there is anything obvious. There are nuts with spring washers that can be tightened, and there are both the rubber bushings on the shift lever and the two fibre bushings (C1906 and C1907) that can be replaced. 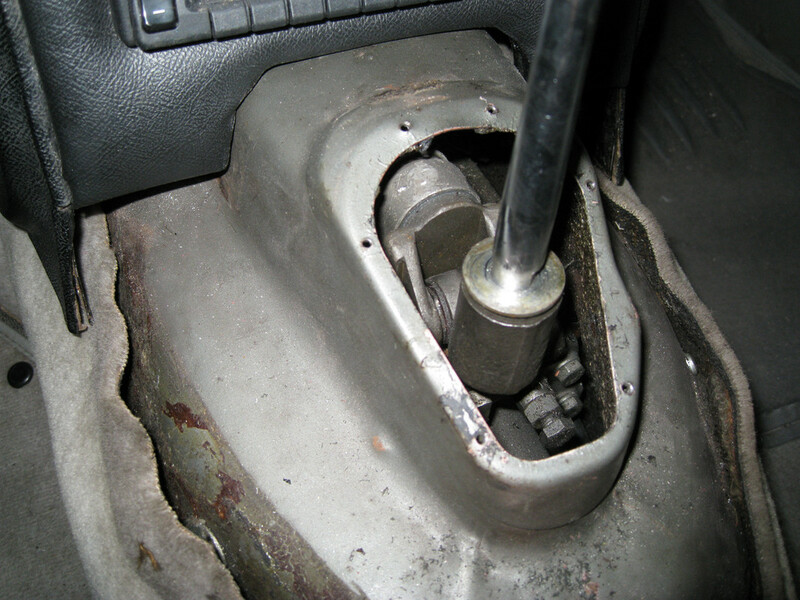 As David says sometimes the console or rubber shift boot can prevent the lever from going forward which can contribute to the car jumping out of gear. I was driving with the rubber boot and console off to check the action and it popped out of third twice in 10 miles.Prompting my post. It vibrates more under on or off throttle but is fine on light throttle. Second is bad too but first and fourth are quite steady. Gear box mount spring appears newer and is centered. Vibration is front back not left right and gear box appears steady but it is not easy to stare at it while driving. My gear lever vibrates (back and forth under power) in third, always has done. I'll not suggest it is normal, but I've lived with it for 60,000 miles. I'm sure someone who knows about Jaguar gearboxes will be able to identify where the slop is that allows this level of vibration on the gear lever. Many years ago I had a problem with selection of gears, which included the car occassionally popping out of gear. The cause was not wear in the gearbox, nor the selector rails, but the rubber bush at the base of the lever where it engaged with the pivot. The vibtrating mentioned above had allowed the bush to ride up the lever, and this made the engagement of the lever with the selector rails less positive, and the meshing of the gears less precise. This caused the popping out of gear. The bush was supposed to be kept in place by a step in the shaft of the lever. It didn't work with the lever vibrating in third gear. My solution was to remove the lever and place a large flat washer on top of the bush to prevent it working its way up the lever. This the lever with washer in place, before tightening up.